Communication is the foundation of successful projects. It doesn’t matter whether you’re building a house or designing a website, strong communication is crucial for on-time, under-budget project delivery. One way to improve this facet of project management is to map out your communication plan. By identifying key stakeholders and their requirements, you’ll be able to anticipate their needs much better. The result? Happier clients and more productive teams. But creating a client communication plan isn’t easy. 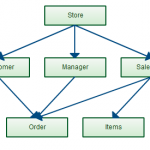 You have to factor in the habits of multiple stakeholders and outline all their requirements. I’ll show you how to map out this plan below. Have you ever worked on a project where clients constantly complained about being left in the dark? Conversely, have you ever experienced project delays because you couldn’t get a hold of the client to sign-off on a key deliverable? Client communication is complex. The bigger the project, the more “layers” of decision-making you have to wade through. Figuring out what, when, how and how much every stakeholder should know can get messy very quickly. This is where client communication plans help. As the name implies, the client communication plan is a document that outlines the specific processes and strategies for effective communication with clients on a project. For example, you might have a project with different stakeholders at different stages. As you progress through each stage, you want to keep earlier stakeholders updated with the project’s progress. However, you don’t want to give all stakeholders the same information. Earlier stakeholders need to be cued in only about the overall progress, while those for the current stage need detailed status reports. A client communication plan will help you map this in an easy to follow, visual manner. Organization-wide plans which dictate the rules for all client-facing communication across the entire organization. For instance, you might have clear protocols about including email signatures or mentioning specific Twitter/Skype handles in all outgoing emails. Project-specific plans which dictate the communication rules for a specific project once the project proposal is approved. This is a subset of the organization-wide plan with changes made for a project’s particular requirements. Stakeholder-specific plans which dictate the communication rules for a specific stakeholder. These spring from the project-specific plan but are modified to fit a stakeholder’s requirements. Your goal should be to go from broad to highly specific. Your organization-wide plan might prioritize Skype for audio chats and Join.me for video calls. 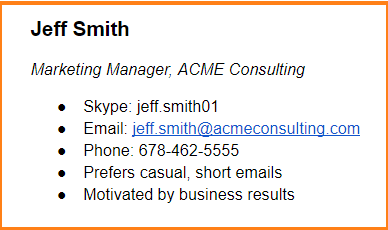 Your stakeholder-specific plan will include the exact Skype handles and Join.me URLs for communicating with a particular stakeholder. The big question now is: how can you visually map your communication plans? I’ll answer this question below. Client communication plans are all about the details. A good plan specifies exactly what, when, and how each stakeholder should know. Since so much of this plan revolves around stakeholders, identifying them should be your first responsibility as well. Anyone who is interested in the outcome of a project can be termed as a ‘stakeholder’. This includes a whole range of people with varying degrees of involvement or interest in the project. A client who directly authorized the project is a stakeholder, as is a journalist who wants to write about it. Internal stakeholders: People within your organization who want to see the project completed successfully. This includes the project team, account managers, and top management. External stakeholders: People on the client’s side who have an interest in the project. This includes your primary contact, the project’s key sponsor, and anyone on the management side who needs to know about the project. Third-party stakeholders: Non-client, non-internal stakeholders who still need to be updated about the project. This includes evangelists, influencers, journalists, and investors who need to know about a project’s status. A typical project will have several stakeholders across all three categories. At the very least, you’ll have the client’s liaison, key sponsors, and your own internal management to take care of. Larger projects will invariably have a long list of journalists and influencers to keep in touch with. However, not all of these stakeholders are equally important as far as communication is concerned. You might want to email your immediate boss every two days about the project’s progress. But you can’t adopt the same schedule to keep your company’s C-level execs in the loop. Therefore, you also need to understand your stakeholders’ priority. Influence: How much influence does this stakeholder wield in a) the organization, and b) the project’s outcome? A CMO on the client’s side might have limited interest but has the authority to halt funding if the project isn’t progressing fast enough. Interest: How interested is the stakeholder in this project? A CMO who authorized a project might be marginally interested in it. But the marketing manager who originally came up with the idea would have extensive interest in the project’s success. Try to score each stakeholder’s influence and interest on a scale of 1-5 (5 being the highest). The higher the score, the more important the stakeholder will be for successful project communication. Armed with scores, you can further segregate your stakeholders as primary, secondary, and tertiary stakeholders. As per this map, you have to focus your communication primarily on the first row of stakeholders. As you go down the hierarchy, your communication frequency and length will decrease. You’ll want to email the account manager daily, but the VP of Client Services only needs to be notified once in two weeks about the project’s progress. 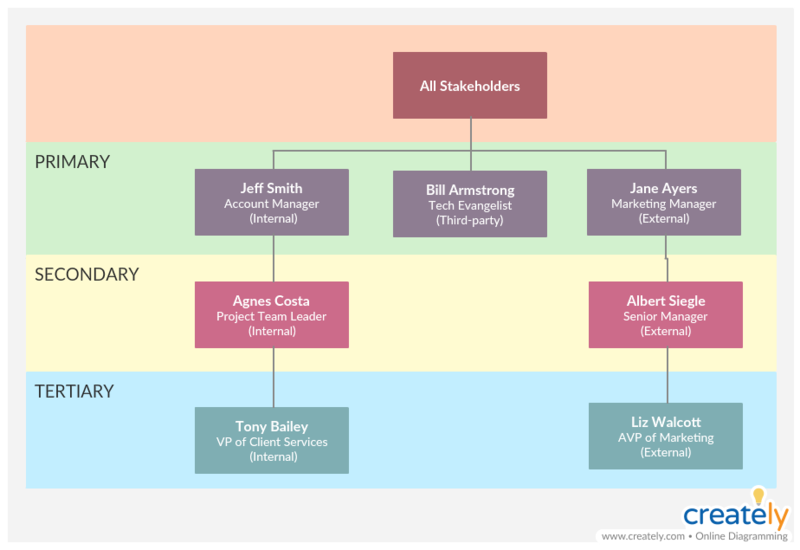 Mapping stakeholder hierarchy helps you visualize your communication priority. Contact details, including phone numbers, Skype handles, and email addresses. Communication preferences, i.e. how each stakeholder likes to be contacted. Communication timeline, i.e. when to start sending out communication. To solve this problem, you can create simple “client profiles” that list their contact details and communication preferences. Think of it as a customer persona, but with fewer details. For the rest – communication frequency, timeline, etc. – a much better way to represent your data is to visualize it as a Gantt chart. 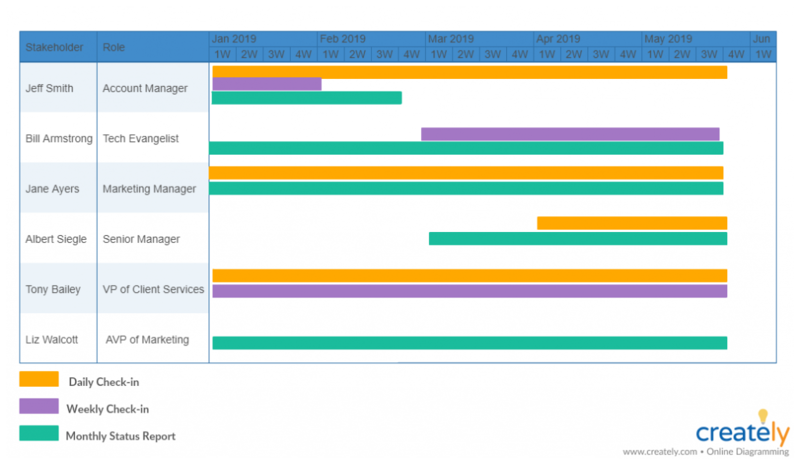 This Gantt chart can show the start/end dates for different communication types (daily check-ins, weekly check-ins, monthly status reports, etc.) for each stakeholder visually. You would know at a glance what kind of messages to send to each stakeholder. Here, the ‘Account Manager’ would receive daily check-in emails for the entire duration of the project. In contrast, the ‘AVP of Marketing’ would receive only a monthly status report. This is a great way to visually map your client communication plan. Combined with the stakeholder hierarchy you mapped earlier, it will show anyone on your team when and what kind of messages to send. Client communication is crucial for successful projects. But far too often, communication plans get mired in unnecessary details and inaccessible fluff. 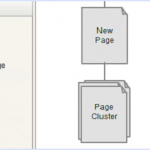 What you need is a quick and visual way to map hierarchies and communication timelines. 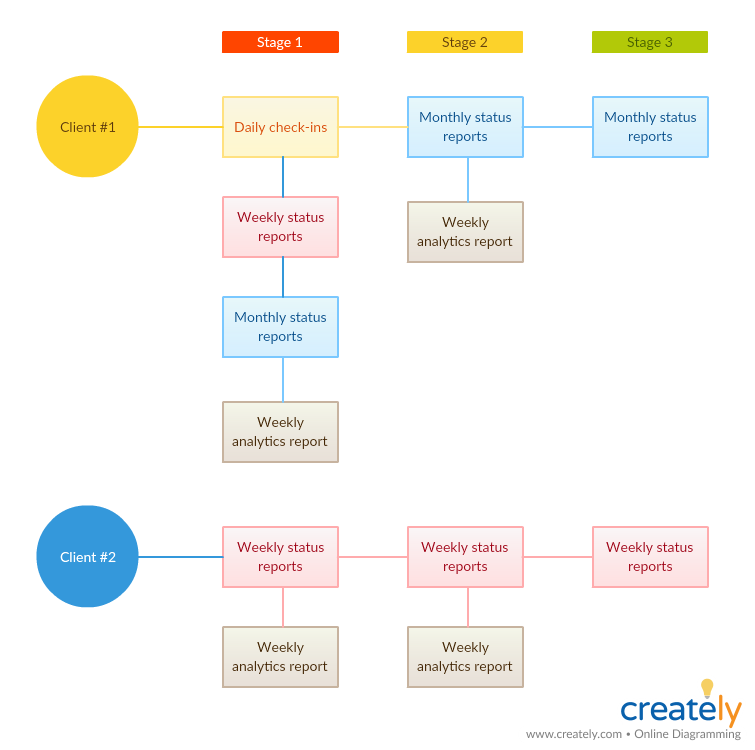 As the above examples show, a visualization tool like Creately can make this process so much easier. Try using these visual maps in your next project. You’ll be surprised at the clarity it brings to your communication. Jeff Sullivan is a marketing manager at Workamajig where he helps creative firms manage their businesses better. When not geeking out over the latest in social and SEM, he can be found plucking his guitar and fiddling – hopelessly – with the piano.